gPodder is an easy-to-use podcatcher, able to subscribe to free audio and video content ("podcasts") to open on your computer or on the go. 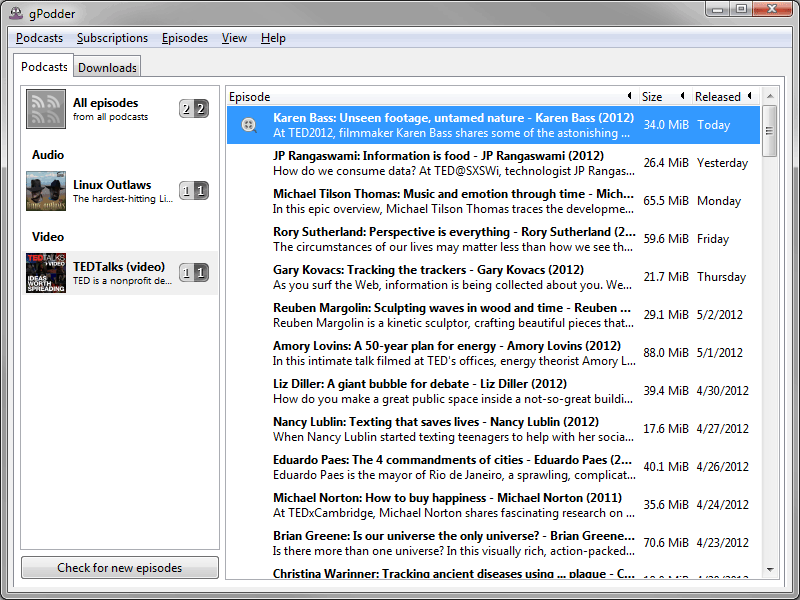 The program can batch download all recent podcasts (often as many as 30 episodes). Features synchronization with a variety of devices including iPod, MP3 players, and mobile phone support. Works with RSS, Atom, XSPF, Vimeo, YouTube, Apple and Soundcloud feeds. gPodder is cross platform (Mac/Linux) and gPodder Portable is a portable wrapper for the program. Includes optional integration the with my.gpodder.org Web Service. How to extract: Download the self-extracting EXE and extract to a folder of your choice. Launch gPodderPortable.exe. Hopefully other entries could be added including those already listed @TPFC like Gpodder. 3D Youtube Downloader searches and downloads a variety of media from YouTube, Vimeo, Dailymotion, LiveLeak and many other sites for playing outside the browser or offline viewing. The program even downloads subtitles and 3D video from YouTube and Dailymotion. High speed download is available with multipart downloads and HTTP compression, as well as proxy support to help circumvent network restrictions. The search tool includes a variety of criteria including size, detail, ratings and many more. The interface provides options for different types of users including advanced for detailed view of available formats and quality levels, as well as a conversion mode for moving files to a different format altogether. The program supports a variety of media file quality and formats including WebM, MP4, FLV (video) and M4A, OGG, MP3 (audio), as well as conversion to AAC, WMA, SPX and many more. The program can view YouTube RSS aggregators so you can see and download the latest in a series. A separate, non-free version is available for batch operations, but it is possible to run multiple instances of program for concurrent downloads. This is the best program for downloading anything from YouTube I have found. I've always used the batch program and not the standard version, although it works well too. The batch is superior for downloading multiple videos. I use an older free version of the batch program that's limited to a max of 5 simultaneous downloads. From what I understand, the new batch version doesn't work at all without purchasing a license. 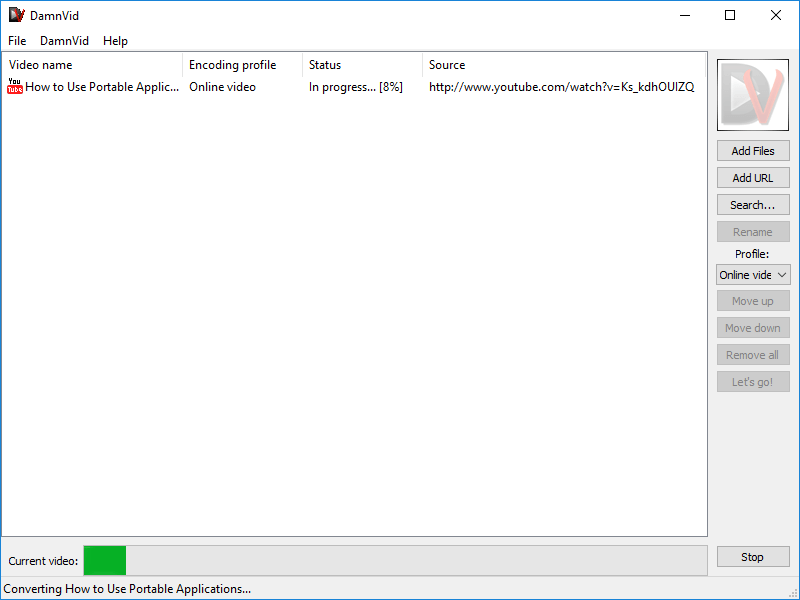 Youtube Downloader HD saves videos to your computer for playing outside a browser or offline viewing. The videos can be downloaded in Flash video format (FLV) or, where available, MP4 formats (playable by iPhone, iPod etc.). The program can also convert files to Xvid format, compatible with most video players. Functionality is limited to YouTube. Although there is no batch download, multiple instances can be opened concurrently in order to simultaneously download multiple videos. How to extract: Download the "Portable Version" ZIP package and extract to a folder of your choice. Launch YouTubeDownloaderHD.exe. mukhi: Please post about possible virus/malware issues in forums. Thanks. Once again, the installer has malware/adware. Web of Trust rates the site with poor reputation in Trustworthiness and Child Safety. The application itself should be OK, but neither the installer nor the download link above is safe. According to VirusTotal, the file at http://www.youtubedownloaderhd.com/files/youtube_downloader_hd.zip is clean... but check before using. InstagramSaver is an easy to use program to download Instagram photos and videos. Just enter the Instagram account you want and start downloading. Note: program discontinued and no longer functional, linking to Softpedia. How to extract: Download self extracting EXE and extract to a folder of your choice. Launch InstagramSaver.exe. @webfork: Thanks a lot, however, it still does not work for me. Either it is a problem with my machine or Instagram has changed something after the last update of InstagramSaver. I would be happy to hear if it does work for others. DamnVid is a cross-platform application to download and convert videos from your hard drive or from dozens of video sharing websites like YouTube, Dailymotion, Veoh, Metacafe etc. DamnVid Portable is a portable version of the program. Cross platform with a client available for Linux. How to extract: Download the self-extracting EXE to a folder of your choice. Launch DamnVidPortable.exe.